He is 25 points down on getting the maximum out of the car, the big error being losing his head in Baku. I don't think the Silverstone one is entirely fair. Vettel was subpar in Britain, but his finishing position was due to blowing his tyre, which he wasn't to blame for. He would likely have finished third on pace alone, which is a lot closer to what you're giving him for an ideal position. Bottas passed him on track. Raikonnen was just faster all race and ahead of him all race. Without Ferrari's help and Kimi's problem he would have finished off the podium. Anyone who denies that Mercedes has been the best car overall so far this season is blinded by bias, because they cannot accept that their favourite driver might just be getting outperformed by a driver with an inferior car. I believe the Merc is slightly better, but nowhere as much as you claim it is. You say it is similar to the 2010-2013 Redbull advantage. I say no way. Vettel used to pull away from the field and win races with 20-30 sec margin during those Redbull dominance years. He did that so many times. If Webber could get off the line he would usually do the same. This year the Merc have only won that way when Ferrari has had trouble in the race. On race pace alone, they cannot beat Ferrari the way Redbull used to beat the others. Impossible. Morever, Vettel is often quicker than Bottas in the race or in qualifying. At least his driving has been able to make a difference. In the V8 redbull dominance era, a driver could rarely overcome the car advantage Redbull had. I agree with you that Mercedes is only slightly better and the fact that Ferrari had 3 poles (3 front rows lockouts too!?) proves that. But I dont think the gap at the end of the race between the leader and the one finishing 2nd is a real representative of the strength of the cars they drive anymore. Nowdays with engines in very limited supply, stressing engine components by pulling out a huge gap to the car behind, its not a wise thing to do. I'm pretty sure engine saving was going on during the V8 era as well. Vettel used to take it easy towards the end and then show a fastest lap. It doesn't really matter anyway because everyone is doing the same thing, the gap at the end was usually quite representative of the pace of the cars. 4th on pace if neither Ferrari had tyre issues. The critique is quite hard on both drivers and expects them to beat their team mate every single race baring mechanical issues/ bad luck. Vettel wore his tyres out pushing too hard trying to match Kimi and stop Bottas catching him. He completely wore through his tyres, something that no driver has done all season. His tyres had 0 life, 5 laps before the puncture - that is why he began to lap 2-2.5 seconds slower at that point and was on the radio asking if they should change them. On the surface it seems it was a Ferrari issue, but this is not true, Kimi's tyre failure was not related to wear and the cause is unknown but it was a sidewall failure and not the surface of the tyre. His poor finish was a combination of poor qualifying (thus getting jumped at the start by Max) and then poor tyre management. Given his relative slow pace that race he should have settled for 4th but he lost his head a bit like he often does if his team mate is ahead/faster. Raikkonen's tyre also blew, are you going to blame him for overdriving too? Pirelli said that Vettel's puncture was a result of small debris. It's purely bad luck that Vettel got a puncture. To claim that "his driving cost him 12 points" is pure bias and just a desperate way to make Hamilton look better this season. lamo, we all know you wouldn't blame Hamilton if he got a puncture without hitting anyone. Sorry, you're wrong I think. Kimi's was debris. Vettel wore through his. That's not bad luck. Pirelli have said it was a slow puncture but it's impossible to know what caused it as the tyre was so badly damaged by the time it got back to the pits. There's speculation it would have been debris, and that seems to be the most likely cause, but Pirelli say they can't prove that it was/wasn't. Happy to amend in light of new information. The information I had was Vettel used all the rubber (which he did and was evident from the other 3 tyres) and that is why his times were very slow 7 laps before the failure. Given what I have seen in that report I had it wrong I only read that Kimi's was not related to wear, then it would be 13 lost in Baku and 6 lost in GB, so 19 points for Vettel and 25-28 for Hamilton. So 6-8 points difference between the pair thus far with Vettel having the luxury of a slower team mate and, not being beaten by Kimi in either one of Monaco or Hungary which would have increased his total further and Kimi having a failure in Canada when on course to finish ahead of Vettel too. Bottas hasn't had a failure issue whilst ahead of Hamilton thus far. Would that be fair and unbiased? I think if anything, plucking figures out of the sky for how Vettel would be doing is a bit more bias and entirely subjective. Given what I have seen in that report I had it wrong I only read that Kimi's was not related to wear, then it would be 13 lost in Baku and 6 lost in GB. How does Vettel lose 6 in Silverstone? Was going to finish 4 instead of a maximum obtainable 3: the dominant Mercedes and the tyre issue got Bottas to overtake him. So that's three points? Also can't understand how you mention Canada. Surely not Vettel's fault Raikkonen was en route to finish ahead? So there weren't going to be points to deduct for Vettel irrespective of what happened to Raikkonen? Kimi was on for 2nd before the tyre issues so without them I assume he thinks Seb should have at least matched his performance. On the tyre issue for Seb was the lock up fighting Bottas not partially blamed or was the lock up caused by the issue?. Kimi was going to finish 2nd without the tyre issue. Ferrari was capable of 2nd with Bottas starting 9th. Bottas was 4.3 seconds behind with 3 laps to go in Silverstone and not going to pass. Kimi's tyre issue was just bad luck as it appears was Vettels. Vettel performance was good for 4th, if he had out qualified and driven just equal to Kimi he would have 2nd. If he drove where he normally is (15 seconds up the road from Kimi, couple of tenths ahead in qualifying) he would have a very comfortable 2nd at Silverstone. But its a weak track for him as Mark Webber said before the weekend even began. You'll also notice that I put Hamilton as a possible 2nd in Hungary when most would probably saw it was a nailed on Ferrari 1-2. Usually its one of his best tracks so I think he should have got Kimi there. Like I said, it is a harsh critique of each drier and expects them to beat there team mate every race with the only exception being mechanical issues. I didn't add anything for Canada, I just highlighted more to show Vettel hasn't delivered perfection (i.e. avoiding incidences at turn 1) that he would need to be 40 ahead in a reverse scenario and he has contacted Max twice at turn 1 this year already as well as however many contacts at turn 1 last year. Its a weakness for him and the other rivals too this far. Kimi has had 2 first corner incidences (Spain and Baku) as has Bottas (Spain and Baku) whilst Hamilton is usually extremely cautious and more likely to get overtaken like in Hungary. So I guess different approaches. I find it a bit odd that Vettel should be given any portion of blame for the events in Canada. Max tried an ambitious move: should everybody just back off and wave him through? Agreed. Nobody was to blame for Canada. Typical first corner mini collision. Hamilton has been exceptionally poor when the Mercedes is not railroading everything in front of it. So how you expect him to outqualify Bottas something he has not done this season when the car is not dominant is beyond comprehension really. Hamilton has made the battle look close, had the roles been reversed, with Vettel in the Mercedes, he'd be out of sight. This is a difficult one. I get the feeling that the Mercedes is now the slightly faster car but is more sensitive to different tracks, mostly because of the wheelbase? The Ferrari started the season as the faster car but might have lost that position, but it still seems like the better overall package. Overall slightly faster after 5-6 races. At suited tracks alot faster. Not as heavy at the start of the season. Not as sensitive to different tracks. He made a bad start, that was on him. Kind of 2016 Hamilton esque which I think was pretty universally agreed that he lost a lot of points by making bad starts. Even if Vettel didn't incur damage he lost 2 places off the line. Whilst Vettel wasn't too blame, it is no coincidence he has had more first collision contacts than any other top driver the last few seasons. I can think of 6 in the last season and a half alone without even looking it up. Its a tactic that can win points and lose them, Hamilton in contract is also very risk adverse into turn one (since Japan 2008) and loses places because of it. You also need to apply different rules to Max, he is a risky driver to be around on the grid. Bottas and Hamilton drive the same car, what difference does it make if it is dominant or not at any given track. The car is the car. Dominance is a relative term in comparison to the Ferrari. The car has a given time it is capable of at each track and how fast Ferrari is has zero to do with what that time is. Do you think Kimi would be leading the WDC if he was in a Mercedes? Don't know if this was already posted, but very good vid about Merc and Ferrari. The advantage Ferrari has in the low speed corners is so evident here. Merc definitely faster on the straights and seems on par in the high speed corners. Only Bottas has been able to extract that time on the days the Ferraris have been on pole, how is that difficult to see? Like I said, what does the times the Ferrari drivers do have to do with the times the Mercedes drivers post on any given weekend? Nothing. The two most dominant Mercedes poles this year, Baku and Silverstone - Raikkonen beat Vettel. Using your logic, when the Mercedes is at its most dominant, Vettel becomes slower than Raikkonen? That is also nonsense. So if Mercedes is very dominant in Spa, Vettel will be behind Kimi? Likewise, if Ferrari is quicker, Hamilton will be behind Bottas? Very simple way of looking at things, those are the kind of patterns my 11 year old nephew observes, although David Croft is also guilty of such nonsense and he has a lead commentary job on F1. Last edited by lamo on Sun Aug 13, 2017 8:24 pm, edited 1 time in total. (BIB) Agree Merc marginally better over 1 lap. But isn't this Ferrari 3 pole stat somewhat misleading? With cleaner laps, could Ferrari have not secured pole on more tracks e.g. Spain, Canada, Austria? A few times now, we have heard Vettel admit he had the pace to challenge for pole, that he could have done a better job? Canada was out of reach for Ferrari IMO, its the equivalent of presuming that Mercedes could or should have had pole in Monaco if not for Hamilton's mistakes (and Mercedes not nailing the car setup properly). As for Spain and Austria, its not as if the Mercedes drivers had flawless qualifying laps themselves and good arguments can be made that even Russia should not have been a Ferrari pole / front row in first place, with Bothas topping Q1 and Q2. At the end, 8 / 3 in qualies in Mercedes' favor is a fair reflection I believe. Fair point re Canada. Austria/Spain could have gone either way. Very little to separate them. Lewis last lap was a stonker and Seb made a mistake on his 3rd run so it opened the gap back up to 3ths but Seb's ultimate best sectors would have only put it 0.130 behind if he put them together. I'm not entirely convinced the Mercedes was out of reach there. Yes Vettel right behind Raikkonen is same as Hamilton behind the Ferrari's and Redbull's, my logic stands every time the Mercedes is not dominant Hamilton falls behind Bottas. Is Vettel guaranteed to beat Hamilton in Abu Dhabi since he has beat him 3/3 in races beginning with A so far? Last edited by lamo on Sun Aug 13, 2017 10:52 pm, edited 1 time in total. I don't know how to interpret this, but this person has been doing these for a few years and quite interesting. 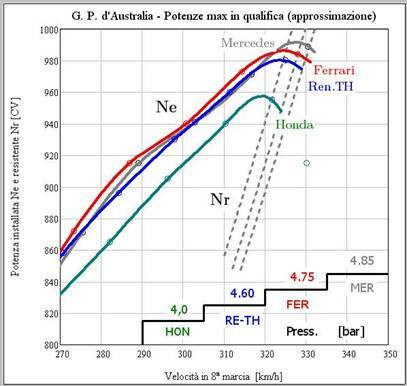 Approximations by Enrico Benzing @ www.formula1benzing.eu - its a shame its all in Italian because a lot of his stats are very interesting. I am not sure of how he arrives at the engine power ones however. If I can remember rightly it was estimated using gear ratios,on track sound analysis and some other data provided from Ferrari engineers, at least in 2016. "I believe in Vettel, because I know his mental strength, and Ferrari has raised its game,"
"Ferrari was clearly the stronger car in the first half of the season and only due to various circumstances could they not materialise all their chances. "Silverstone, I would say, was an exception." I think the car dividing opinion as much as it does shows there's no clearly best car so I don't exactly agree but thought it was interesting anyway as he has no horse in the race and is a bit of a straight shooter. I think Bottas in general was a bit underrated, I was guilty of that for sure, but I think in general they're both very good cars but with being different concepts it can look better for one of them track to track. I don't think Kimi started the year very well but has been pretty decent since Monaco to be fair to him. Helmut Marko reckons the Ferrari was clearly the best car in the first half and backs Seb to win the title. It's almost impossible to come to that conclusion. Come on, we both know it's not that black and white. Compare Lewis Hamilton stats with Prost or Senna. To be fair, how do we know Lewis isn't better than both? Not that I necessarily believe he is, but you can't say that he certainly isn't. The Ferrari/Mercedes comparison is bogus, however, because we know that while Lewis might or might not = Seb, Kimi does not = Bottas. You can't draw conclusions on the car based on the performance of two drivers we know pretty darned well aren't performing equally. My point was you can't conclude anything from raw stats alone. Cars are influenced by drivers just as drivers are influenced by their cars. If you only look at that picture maybe (and didn't automatically assume Lewis was just much better than Seb of course). Thankfully all the race weekends were broadcast for us that weren't there, regardless of any particular opinion on the drivers and there's been plenty of evidence and data to make arguments for both and both have obvious strengths and weaknesses and dominated weekends. It's looked close overall to me so far so I'd agree there's no clearly anything fwiw. I thought when Mercedes fixed their tyre issues post Monaco and Ferrari were getting hammered with directives to change their car it was looking like a Mercedes walkover but Ferrari recovered much of what they lost and Mercedes tyre struggles reared it's head again suggesting it's not entirely a thing of the past. Mercedes also won China and Spain on strategy/luck. Ferrari won Australia and Bahrain on strategy/luck. It could be quite different on the wins totals - Spain was the luckiest a driver has got all season (Hamilton and his VSC pit stop) and seemed a track Ferrari should have got pole and the win on. Ferrari also could have won all of the first 6 races, but really only been in the hunt for 1 of the last 5 at the track everybody knew they would be strong at. The momentum has moved toward Mercedes for sure over the last 5 races, but Hamilton has had a gearbox change and lost a win in Baku. Hamilton would have a 5 point championship lead heading to Spa and Monza (Mercedes territory) without the head rest issue. I think if that was the case and given Mercedes/Ferrari form over the last races, people probably begin to start writing Vettel off in that scenario? I think Azerbaijan as well. Vettel would have won if he'd kept his cool and when Hamilton was behind him later in the race he couldn't even close a relatively small gap. Mercedes had a pace edge there but it wasn't big. Vettel winning in Baku would have been circumstantial though... Hamilton taken out due to head rest, Bottas out due to collision, Kimi out due to collision... in a normal race he would have been 4th on the first lap. The car wasn't quick enough to win that race on its own, where as it was quick enough to fight in the first 6. When Hamilton and Vettel ran 1-2, Hamilton was able to build a 3-4 second gap quite easily. Hamilton was also quicker at the end but lost quite a lot in the dirty air. I think Hamilton could have overtaken Vettel that race, it was just every time Hamilton was close. Vettel also had DRS or a slipstream over the line. DRS + slipstream meant about a 1 second gain on that monster straight. Slipstream was worth about 0.6 and DRS about 0.4. If Hamilton got into DRS without Vettel having DRS or a toe from a car in front, then Hamilton would have passed him. This happened only once, on the very last lap and Hamilton crossed the line 0.200 behind and Vettel did not lift at all for the line. He would have passed him and finished ahead if the race was 1 lap longer. Barring Silverstone, Ferrari has had the least variability. Thats about it. Its more consistent car in hands of Vettel. Mercedes has had its ups and downs and they did get lucky in 2 races due to SC/VSC. Its fundamentally better suited cars for modern F1 circuits. Ferrari need to address their weakness which is they have more drag and slightly less engine power. They either need to run higher engine modes more often or find ways to reduce drag on upcoming circuits without losing too much downforce (they can afford to lose some). On twisty, bendy circuits, this extra downforce and traction in those section helps them. On upcoming circuits it will hurt them like we saw in Silverstone and to some extent Baku as well where they were coming under serious threat from even lower teams. its not the question of which car is faster anymore, its question of which car will be faster in upcoming races and if the trend continues, it will be Mercedes unless Ferrari comes up with solution to the car characteristics. Its tougher job ahead for Ferrari as though the nature of their car and their design choices have given them advantages in some circuits, the upcoming power circuits will play against them. I am sure they would have thought about this and must have some concept ready to handle it. The question is, whether the solution they come up with will work or not. Mercedes on the other hand have longer car which generates more downforce simply using its body shape and extra length without increasing drag due to extra angle on wings and winglets. This is where their longer wheelbase is going to help them. They will probably lose Singapore and Abu Dhabi. But they can afford to do that if they win everywhere else. In fact they can afford to lose another race or two with Hamilton winning rest if Bottas can take away points from Vettel in 2-3 races. Ferrari is mad at Mercedes! ABMS learned: "It's about the latest engine upgrade - and an alleged agreement that has been broken. Zoff on the engine front in Formula 1! Surprisingly, it has Mercedes brought the fourth stage of its drive after Spa. But apparently there is more to it than was known so far. Background is a complicated new technical directive of the FIA . 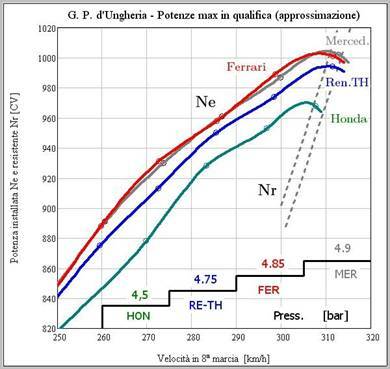 From Monza, on the other hand, an engine can only consume 0.9 liters of oil per 100 kilometers. The FIA ​​Automobile Association wants to prevent oil from being used to increase the performance in the combustion chamber of the engine. Also: All engines used from Monza must comply with the 0.9-liter rule. All other drive units can consume 1.2 liters - a small advantage for Mercedes, which can have combined their latest upgrade with the higher oil consumption! I think we can be pretty happy after this weekend the cars are still very close. Mercedes probably had the better car overall but in race pace it was pretty equal, nowhere near as bad as we could have expected after Silverstone.